Can we really compare the discs in our neck to the discs in our low back? Low back pain is a very common phenomenon. They say that 7 out of 10 people will have low back pain in some form. Low back pain can move from side to side, in which case this indicates that a disc more than likely is involved. As we know ( and can see), the low back has large and small muscles that help stabilize and move the low back. An irritated disc is able to make these muscles tight, spasm, cramp or just not work as they are supposed to. One day the pain is on the right, then the next day it is on the left and then it may just be in the center. So…how can this example explain headaches and migraines? Let’s focus on the upper neck for a moment. The leverage that the muscle has on the second vertebrate can create a powerful rotational moment when the muscle is active or shortened. Let’s examine the importance of this & how it relates to headaches and migraines. 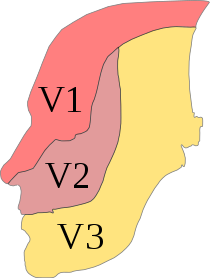 So, the muscle contracts and rotates the second vertebrate. Great; this means a tight upper neck. Now what? Can’t you just get it moving again and all is well? The answer is yes…but. If this has been the situation for and extended period of time and someone has chronic headaches or migraines, then we have some other things that may be involved. Have you ever heard of the brainstem? The Trigeminal Nucleus? Maybe the former but the latter sounds like a space alien (it probably looks like one too). 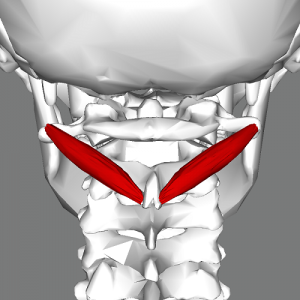 This trigeminal nucleus receives information from the top 3 vertebrate in the neck as well as information from its own pathways (nucleus) that are located in the head and face (see picture above). 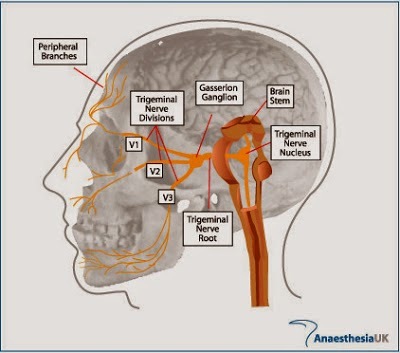 The pathway of the trigeminal information ultimately passes through the brain stem as does the information from the whole body to eventually lead to the cortex (or the brain) to determine how we are to respond to the information that passes thought the brainstem. All of the sensations and experiences that we have from our environment, whether constant or new, are wrapped in a package. When the packages arrive at the cortex (the brain), they are opened and what is inside is what the cortex responds to. All of the medications that are provided for chronic headaches and migraines work to turn down the volume control. They are temporary and have side effects that may have long term effects. The same can be said for the injections and surgical procedures that are used. But what if there is a non–invasive and non–pharmaceutical option to desensitize the brainstem or turn down the volume to the loud speaker? And what if it involves the neck… ? Every headache and migraine sufferer needs to have their neck assessed in a skillful manner to determine if the neck is involved or not. The Watson technique does just this and has shown to reduce the pain of headaches and migraines, as well as the need for medications. Dr. Ryan Schulz has been trained in the Watson technique and is currently the only practitioner in the United States. Read reviews from past patients!